Table Desk Lamp, Banker's Tiffany Style Lamp. 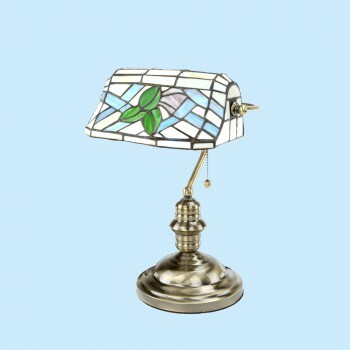 This table lamp isRenovator's Supply's Stained Glass Antique Brass Base New England Summer Design which measures 14 inches high x 9 1/2 inches wide with a 7 inch solid brass base with felt bottom. Takes a 60 watt, B style bulb, not included.